Or what about some major SEO misconceptions, and his secret on getting #1 rankings at the Search Engines for highly competitive keywords over and over again? Then there is how James made $1.5 Million/year using affiliate marketing. Oh, and the secret marketing tip John Reese shared with him over dinner table. Ah yeah, we also talked about what 99% do wrong in article marketing. Then there’s the critical factor when setting up payment subscriptions in order to maximize profits, which is also revealing. Also, the crucial element that enables him to find and hire good ghostwriters. HA! I know what he did to get a float of traffic (i.e., visitors) to his first blog. That secret is also on the DVD. Yes, today is a special day. I’m going to release the first DVD of the interview series I did with James Brausch in Costa Rica this month. 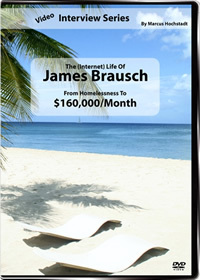 Until noon tomorrow (PST which is GMT-7), you can get The (Internet) Life Of James Brausch — From Homelessness To $160,000/Month for $35. After this 24 hour special the price will go up to $100. P.S. We did this interview in the luxurious Tabacón Grand Spa Thermal Resort in Costa Rica. You may feel like you are right there together with us while watching the DVD. Sun is shining… we’re drinking cocktails… bubbly hot springs in the background… awesome. this seems like a cool deal. A few bucks in exchange for the methods to make $160,000 a month. If I only get it 10% right I will be very happy! I just ordered the DVD. I’m looking forward to seeing it! How long is the interview? You say “release the first DVD of the interview series”. How many DVD’s in total will be in the series? Thanks. Matt, I dunno yet, likely between 9 and 11. Am I correct in reading that all you mention will be on the first DVD and then other things will follow. If not, what is actually on the first DVD? I helped once homeless guy, told him to go to library learn little bit about internet and instead of walking around getting 5c cans he could make at least $10-$30 per day online. I gave him few copies of my articles to get him started. There seems to be some questions cropping up that read like ways to get an excuse as to not to buy. Dudes, read the post. The details as to what are on the DVD are outlined clearly. I just got notified that my DVD has been shipped by Air Mail, looking forward to it! p.s. did you ever buy a first album from a band you liked and find it was their best ever? One possible reason to purchase the first release. All the best Marcus with your business, you obviously invested a lot of time, money and effort into it. Seems to be a cool place to hold a meeting.Wish i could once travel there.